Esbit Solid Fuel Stove And Cook Set | BUDK.com - Knives & Swords At The Lowest Prices! Don't leave for your next outdoors adventure without this stove and cook set! 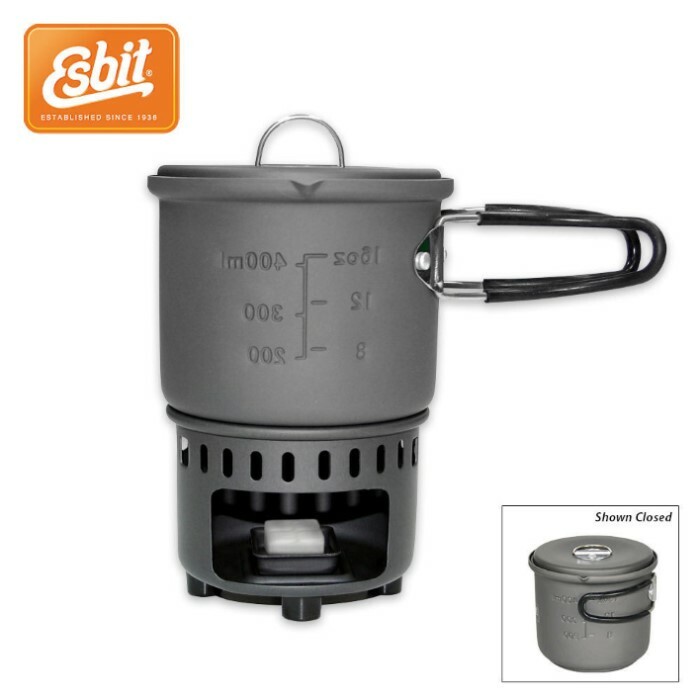 This lightweight, self contained complete cooking system is constructed from extremely lightweight, hard anodized aluminum and works with solid fuel. 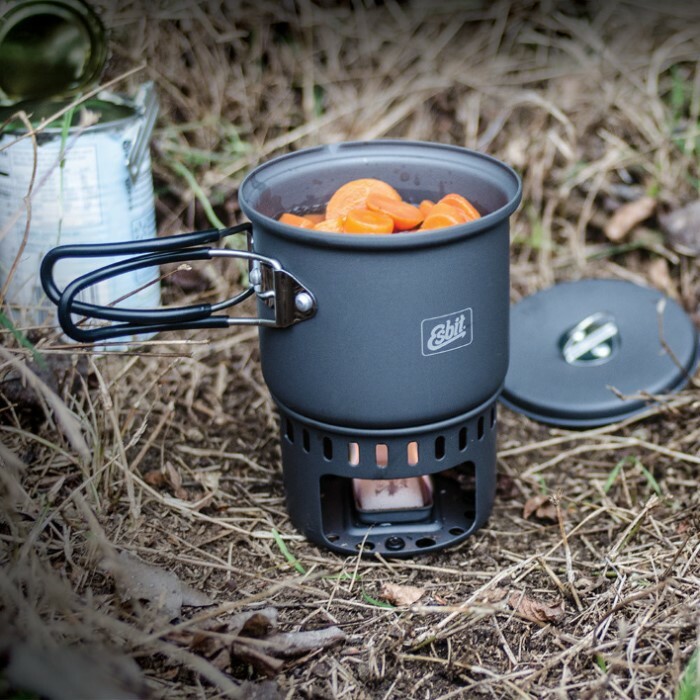 The stove is great for heating water or food on the trail, such as a quick cup of coffee, tea or soup. It includes a windshield type stove and a pot with lid. 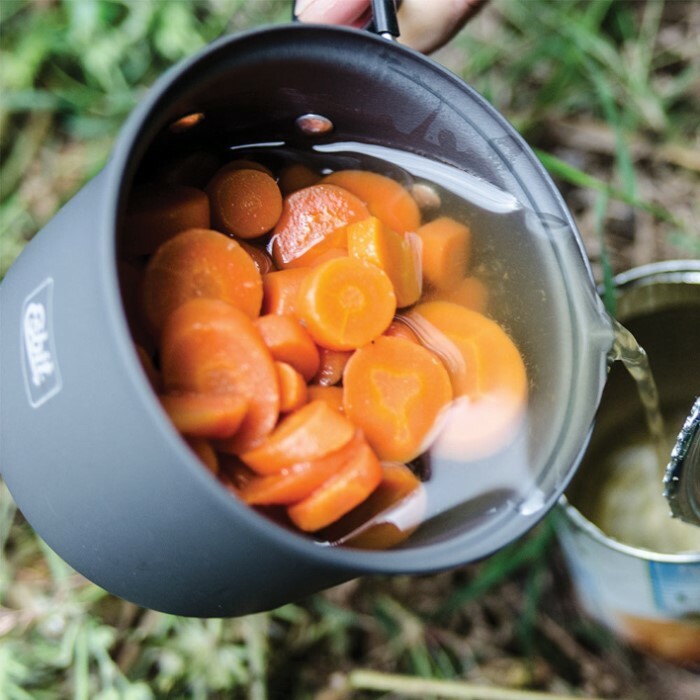 The stove fits in the pot, which has folding handles and a small pour spout, making it space and weight efficient for hiking and backpacking. The durable 585 ml pot has graduations in both ounces and milliliters that you read from the inside when pouring in the liquid. I have two. Can't beat the quality. Buy now before the coming disaster strikes. Got this to have while backpacking. Now that I have used it, I love it. Will be getting one to keep in my S.N.A.P. pack in the jeep. This stove is light weight yet durable. It's perfect for Hiking or Camping and doesn't take up much space in a pack. Great little stove. Nice for camping & cooking a meal when out working & not close to anything. A great little stove! I keep it in my truck for when I'm venturing into the Sierras or the Cascades. No matter what the conditions I'm never far from a hot cup of chocolate, coffee, tea or soup. Very nice little stove for hiking or hunting. Light weight but strong construction. Can use heat tabs -or- twigs, pine cones, etc.. Rattles when packed but stuffing a washcloth inside stops that. I got it's big brother that comes with an alcohol burner too. Both are great for a quick meal or a hot drink. I use both at the same time for meals. Can't beat it. Bought this for my daughters boyfriend who is in Army so he can have a small stove for his ruck to heat ramen noodles and other small quick meals. Perfect size, will be getting one for myself as well.